The Supercooled Liquid Water Content (SLWC) sensor is a device which can be used to measure the supercooled liquid water content of clouds. The sensor operates by measuring the buildup of ice on a thin vibrating wire. The mass of the ice changes the vibration frequency of the wire. The rate of change of vibration frequency can be used to quantitatively determine the supercooled liquid water content of the cloud. 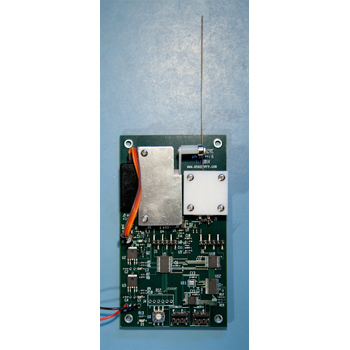 The SLWC sensor is designed to pair with any radiosonde capable of accepting the XDATA digital data format. The vibration frequency of the wire is reported to 0.02 Hz every 3 seconds.